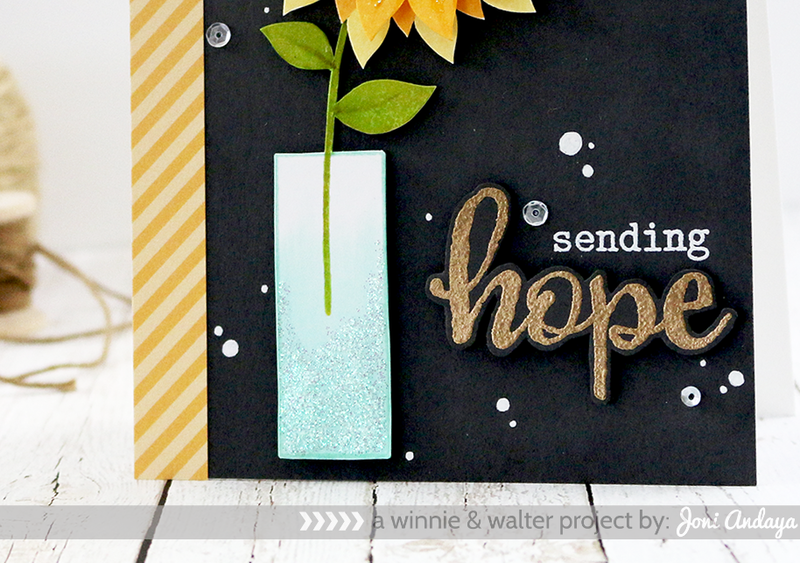 Papell with Love: Winnie & Walter - Day 2 Release Preview & a GIVEAWAY!!! 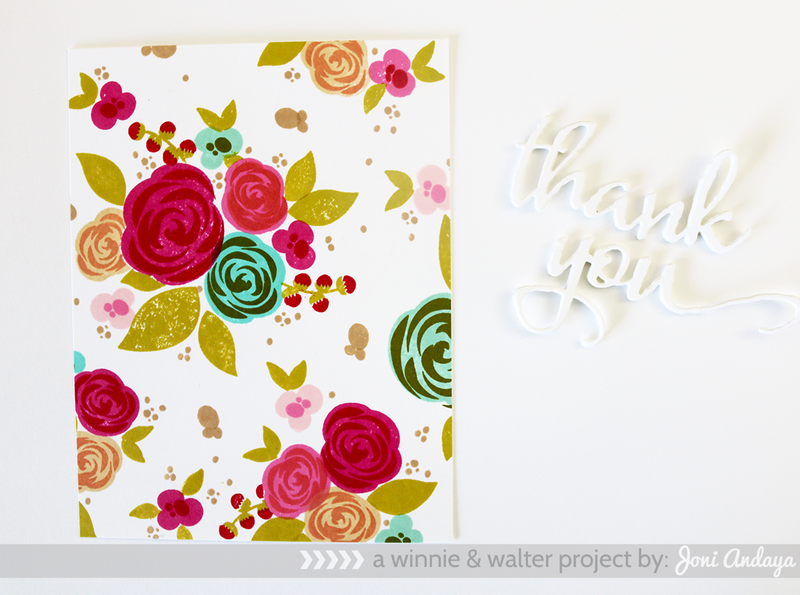 Winnie & Walter - Day 2 Release Preview & a GIVEAWAY!!! 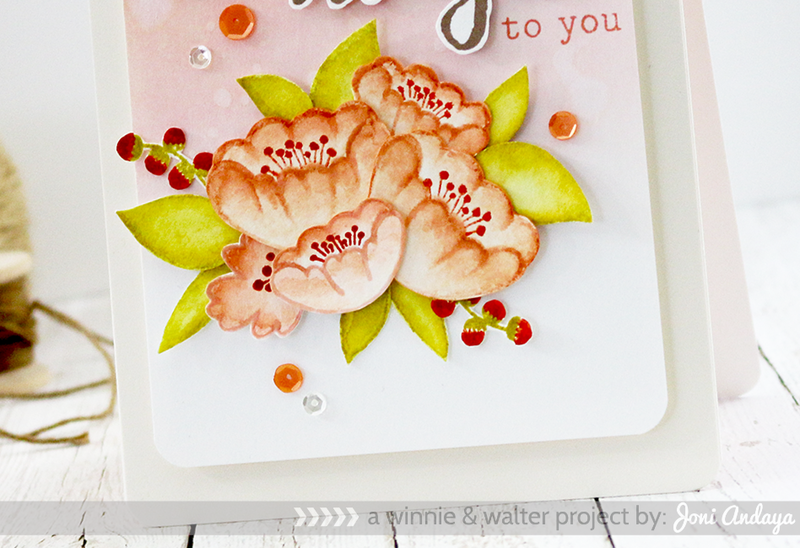 Hello Everyone, Welcome back with Winnie & Walter's Day 2 Release Previews. 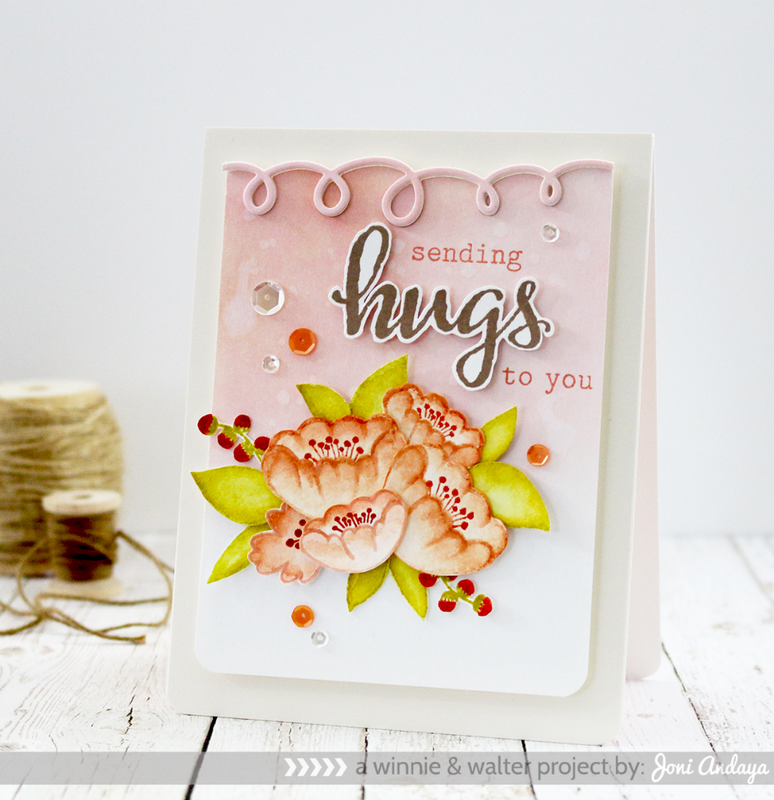 Today Winnie & Walter are showcasing - In Bloom: Lola’s Bouquet stamp set, the flower set I Illustrated for Winnie & Walter. I am really excited about this set, there're just so many possibilities and its really easy to mix and match :) W&W is also showcasing the new In a Word Cutaways (four (4) dies) and the new Essentials: Audrey Cutaways. 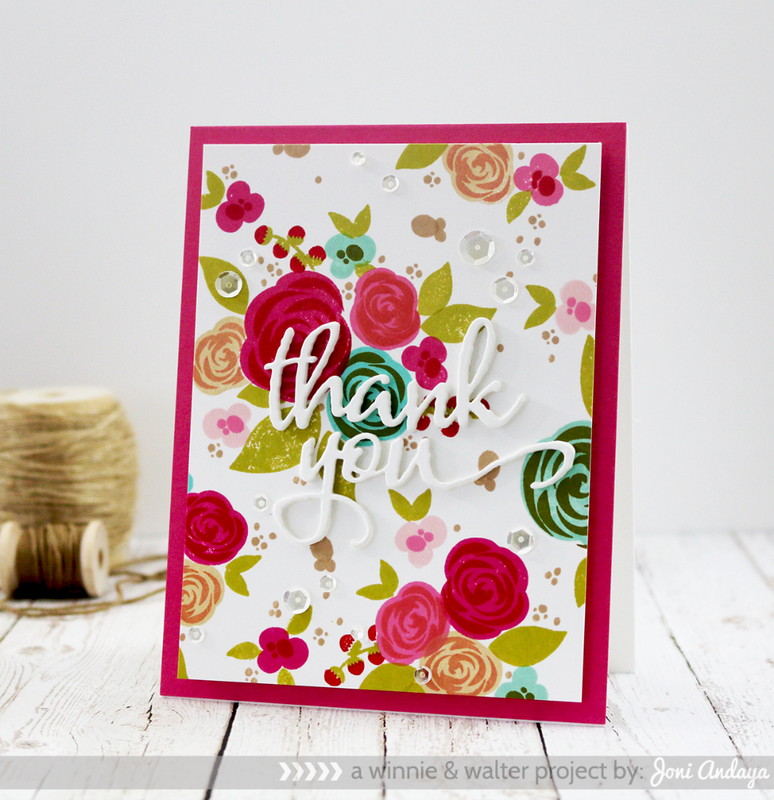 For my first project, I created a patterned background for my card using the new In Bloom: Lola's Bouquet stamp set. I also used the Cutaways "thanks" (I simply cut the 's' on the thanks) and "you" from The Big, the Bold and You for my sentiment on my card. Here's the close up of the sentiments and flower background. For my next, project I used the other open flower image on the set. This flower type is open, easily to color it with copics or watercolor. To begin, I cut a cream cardstock for my card base, I also cut another white cardstock panel where I distressed using Distress Inks in Spun Sugar but only half way of the panel, splatter from water on the panel just to give it a little variation on the background. The sentiment is from the new upcoming The Big, the Bold and Friends stamp set. The "Hugs" sentiment was fussy cut and adhere with foam tape on the panel. On this card I watercolored these flower and leaves, then fussy cut and adhered on the card panel. I also added some sequins from Pretty Pink Posh in Sparkling Clear and Tangerine to finish of the card. For this last project I used some of the leaves from the In Bloom: Lola's Boutique to create a sunflower for my card. 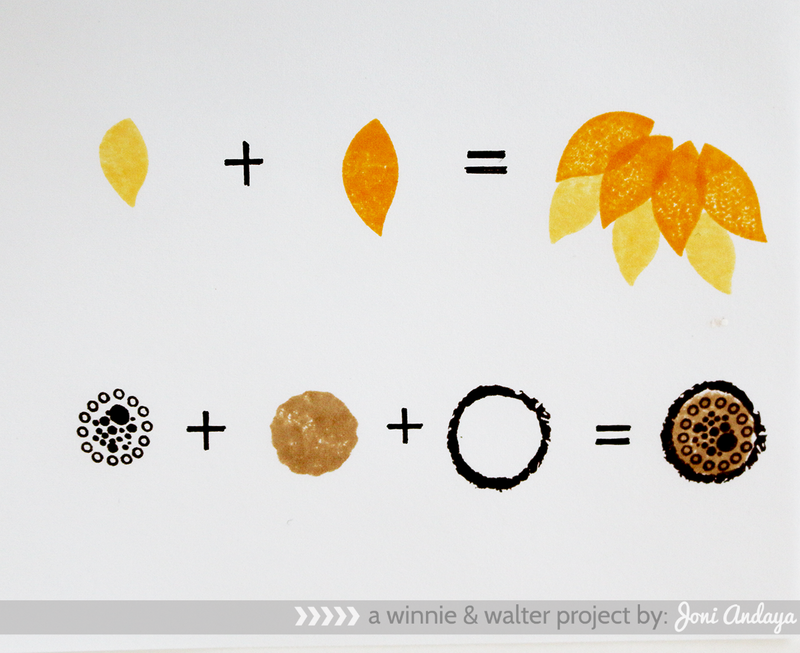 Below is the step by step on how I created this sunflower power. Next, after creating my set images below, I then fussy cut the images again for assembling on my card. For the background of my card I added some dots using a white gel pen Uni-ball Signo Broad. The sunflower, I adhered the one layer petals on top of the two layered petals for dimension on my card. I also added some diamond Stickles on the flower petals for shine. The vase on my card is stamped with the stem and leaves then fussy cut again. The vase was colored with Copics and I added again some diamond Stickles. I hope you can see it in the photo below. The sentiments I used is from the new upcoming The Big, the Bold, and Comfort stamp set. 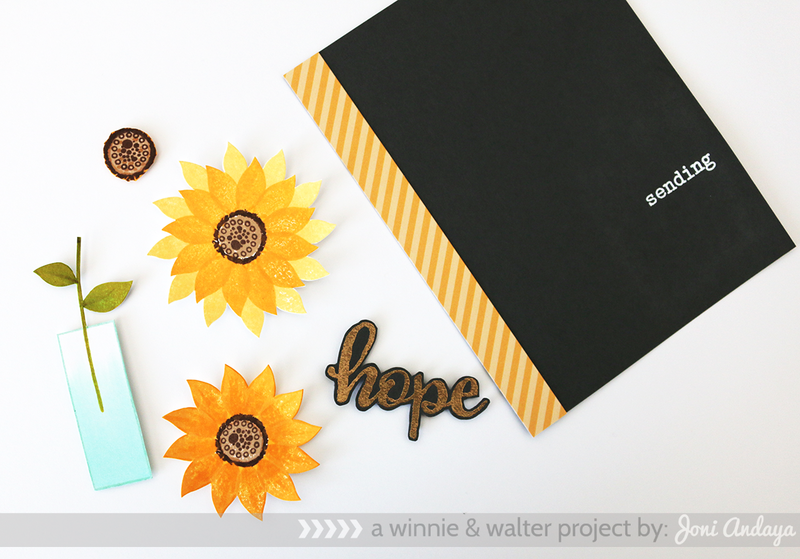 The "hope" was gold embossed on black cardstock and fussy card, then adhered with foam tape. To finish of the card I then added some Sparkling Clear Pretty Pink Posh sequins. I hope you guys enjoyed the possibilities of In Bloom: Lola's Bouquet stamp set. For more inspiration please visit Winnie & Walter's blog. 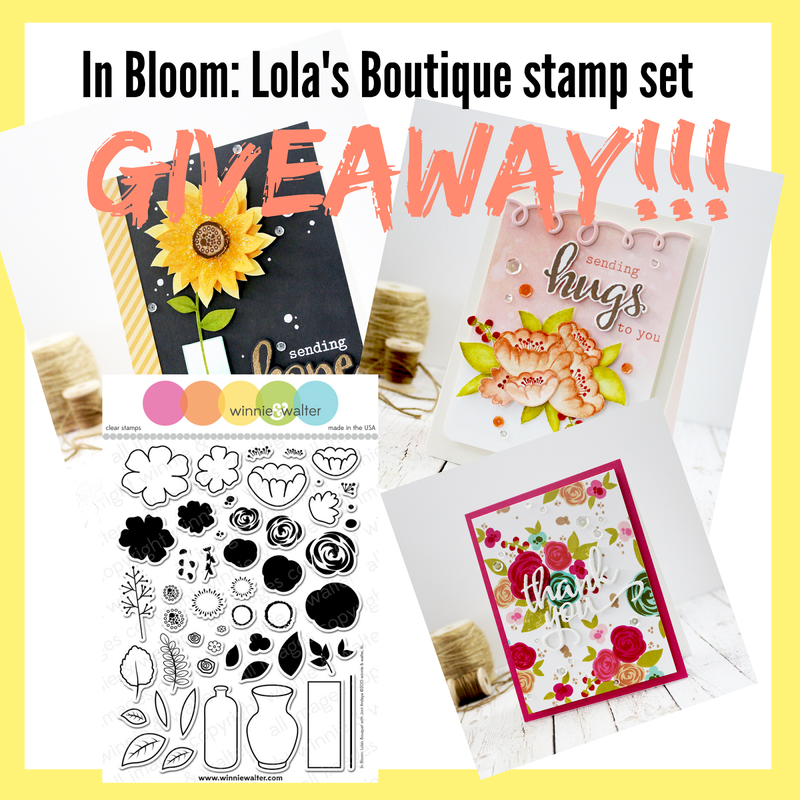 I am giving away a stamp set of the In Bloom: Lola's Boutique. Just leave me a comment until next Monday May 4 11:59 EST. I will post the Winner on my blog, on my Facebook & Instagram the following day. What amazing cards Joni. I absolutely love the last one. I'm still drooling. Congrats on your new set. I'm sure it will be an awesome seller. Lovely floral cards. I like the colors on the first, the dies on the second and I love sunflowers! A girl can't have too many floral stamps!!! Such pretty cards! Love the ombre curly cue to frame the top of your first card! Very pretty! I absolutely love these cards! I definitely need to add this stamp set to my stash! Your cards are such an inspiration! I must say I love the first one best! Oh what a fabulous stamp set! Just beautiful! As I am a sucker for floral images this is a must have for me! These cards are stunning!! Love the creativity in making the sunflower! Love the set thanks for a chance to win! Great cards, love the colors and the Hope card is just perfect. TFS. what a fantastic stamp set (especially for me who practically stamps nothing but flowers!) - your cards are gorgeous - love the sunflower! What a beautiful set! Love your creations! Love this stamp set and what you have done with it...WOW!!!!!!! Beautiful! WOW! Your cards are gorgeous and I love this versatile stamp set! So many possibilities!! Thanks for the chance to win. All your cards are Beautiful---love the colors!!!!!! Pretty pretty set! And I love love love the sunflower you created!! You are definitely right about the lola's bouquet having endless possibilities. Your cards are amazingly gorgeous. I absolutely love the background paper - so beautiful. All the flower cards are great. I really love the sunflower!! Very nice!! I love the dimensions in all your cards - such great choices of color to add to this effect! Wow, what a gorgeous, and jam packed set. I would love to have it! Congratulations on your pretty stamp set Joni!! Your cards are beautiful, love the variety!! Beautiful cards! So fresh and colorful! Great steps out for reproducing this pretty card! This stamp set is fabulous. I love all the elements and the different looks you can get with them. Your cards are always "over the top" gorgeous! SO GORGEOUS!Great stamp set and love your cards! These cards are so beautiful and the stamp set looks like a lot of fun to use. Very pretty! Gorgeous cards! Thank you for sharing your technique!! I was strolling through your post thinking how pretty your cards are when all of a sudden up pops the most gorgeous Sunflower. My daughter and I adore sunflowers and I appreciate you showing how you made it. Win or lose, I must have this set. Thanks for the inspiration. Girl you are too good!! This is amazing!! All of your cards are stunning too! If I don't win this I'll definitely have to buy it! heheh!! Wow! Gorgeous cards and what a fantastic stamp set!! So many possibilities! OMG!!! These cards are amazing, Joni! First of all congrats on your new stamp set, I love it and am so impressed with it's versatility! 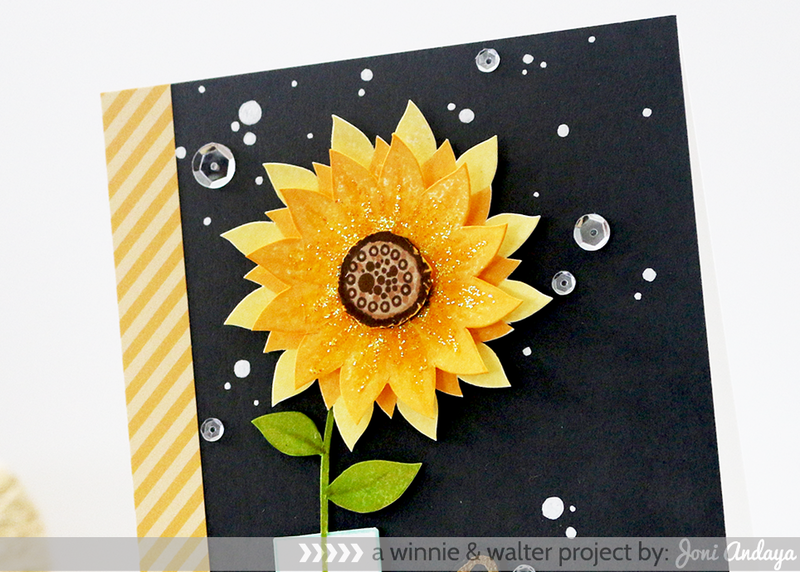 And my jaw literally dropped when I realized you made that gorgeous sunflower using stamps from your set, WOW!!! Congrats on this outstanding flower set Joni! This is a must have for me! WOW... glorious cards! I absolutely LOVE that amazing sunflower! You are a stamp creator after my own heart! This stamp set is amazing! I love the lil stems with the berries and all the extra centers to the flowers to mix n match! Very well thought out! Thank you for the chance to win and congratulations on designing such an awesome stamp set:)... I LOVE how you made the sunflower, simply gorgeous! Gorgeous cards, Joni! Thanks for much for the chance to win your fabulous set! So, so pretty! Love your stamp set!!! 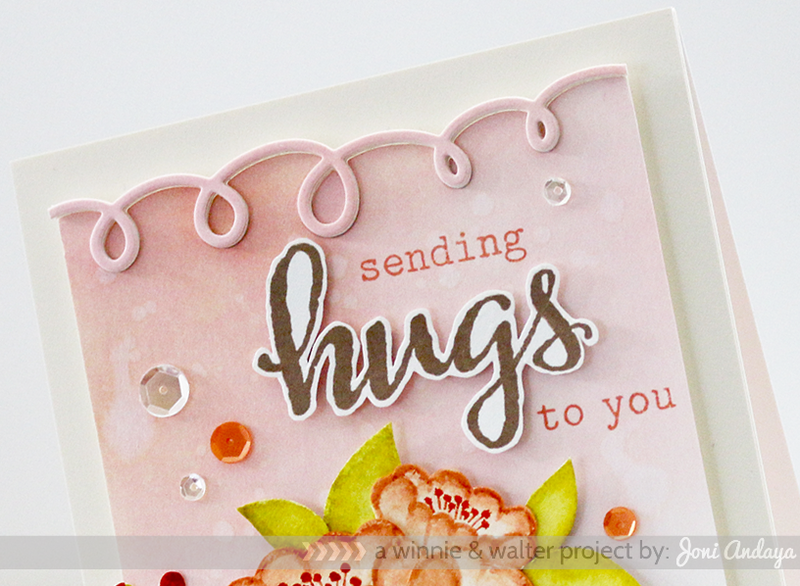 I think my favorite card is the pink Sending Hugs to You....just gorgeous! 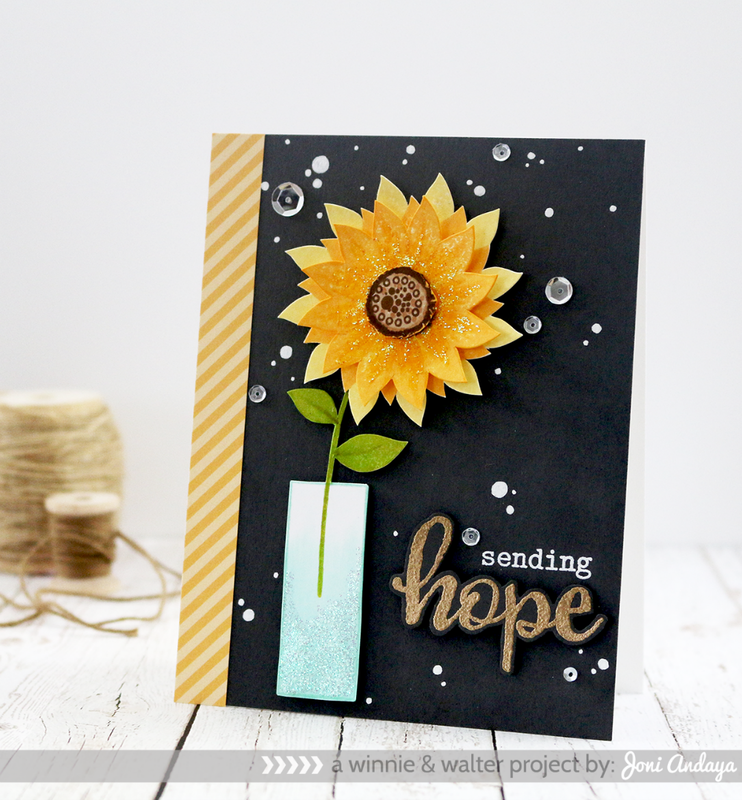 Love your beautiful cards, fabulous stamp set, and the sunflower you made is fabulous! I love all the cards! They're so pretty and thanks for the opportunity for this giveaway! Fantastic ideas, Joni - you've thought of everything! Can't wait to play with them! Joni, this is an amazing stamp set! So many versatile elements! Can't wait to own this one! Great stamp set. So many possibilities. Your cards are beautiful. Beautiful cards and stamp set! You are so talented! So gorgeous! LOVING those flowers!!!!!!!!!!!!!!!!!!!!! These cards are just beautiful!! Wonderful florals! This is a great stamp set, so many different flower combinations. I love the sunflower idea. These stamps are just lovely! 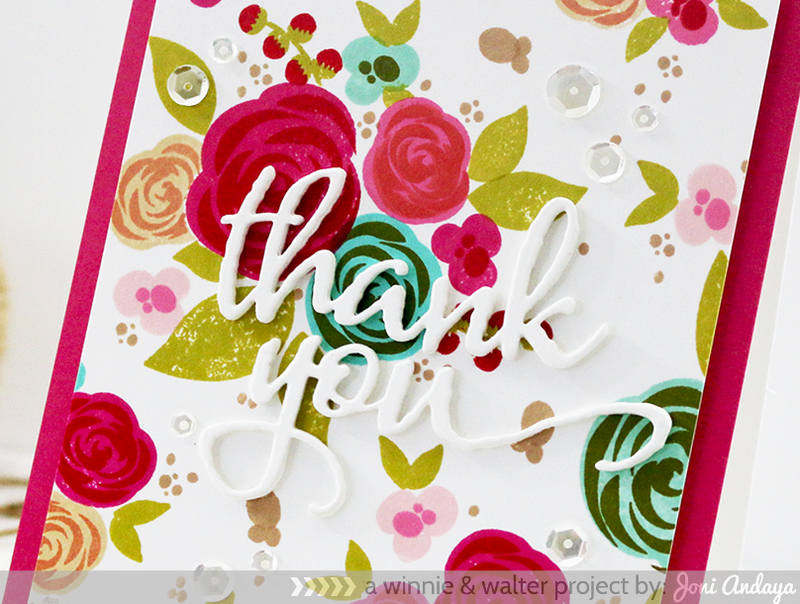 Awesome floral cards, great design and colors! Lovely cards, you did a wonderful job and this stamp set is so versatile! Lovely cards wonderful work! This stamp set is so versatile! Girl you are rocking those flowers.. These are gorgeous.. awesome designing.. Very pretty floral set. Love how you included a vase in this set. Your cards are always so pretty. Oh WOW! These cards are scrumptious Joni! Beautiful blooms that you created and I am sure that this set will be on everyone's wish list! WOW! Great looking cards. I just love the colors. Gosh, I don't know how you come up with so many gorgeous cards. I recognized your first card right away from the sneak you shared a couple days ago! It's just gorgeous!! So excited for you, Joni! This is amazing! LOVE the new sets and dies!!!! Inspirational cards, love them. The stamps are fantastic thank you for the opportunity to win. I love the two step stamps! They make the best flowers! I love the two-step stamps, they make the best flowers! Bright ,Beautiful ! I loved your cards ! Congratulations on this set, its incredible and will be so popular!! Love all of your designs, so many inspiring ideas and thanks so much for the chance to win!! Joni you are an amazing artist. Your stamp designs are fabulous and you always demonstrate such wonderfully inspirational way to use them. These flowers are gorgeous and I love their versatility. I really, really like that sunflower card! It's very beautiful. Oh Joni... you could not know how happy my heart would be to win this set... My mom, Lola, would be smiling from Heaven, as well! Perfect for my granddaughter Lola, too!!! Another awesome illustration! Flowers are my favorite so this is definitely a must have for me. Your card creations with your stamp set are amazing!!! 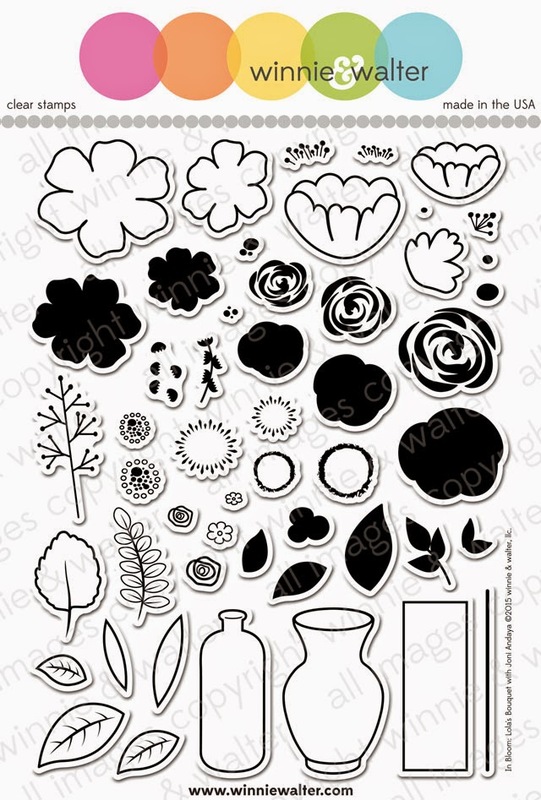 I can't resist a great floral stamp set! <3 love your cards. EVERY SINGLE ONE OF THEM and your creativity (the sunflower)... pure art ! The black background with the yellow sunflower is stunningly gorgeous! They are all absolutely stunning, Joni! What a super fun collaboration!!! Love your gorgeous floral cards in general and these cards are no exception!! What a pretty set, Joni! I think the background on your card that you created with this set is stunning! Congratulations. You must be so excited! Your stamps are DELIGHTFUL and your cards a DELIGHT!!! Hi Joni!! These Floral cards are Ahh-Mazing!! Great Release. Thanks, Paulette S.
Since my Blogger profile for a blog that no longer exists is entirely inaccurate. Thanks so much Blogger/Google for insisting on keeping it and not letting me edit it! So much possibilities with these stamps! This set is amazing! Great job illustrating it. I can't draw a circle, so I am amazed at anyone who can do such amazing work that is so versatile. It is definitely on my wish list! Wplu9 - You Can Do It! Pretty Pink Posh - Matching Game with Giveaway. Wplus9 Smart Kitty - GIVEAWAY!